Cunningham | Quill Architects was recently featured in an HGTV photo essay highlighting residential pools and pool houses throughout the United States. Three of our finest examples, from contemporary to traditional, appear in this sampling of domestic outdoor spaces. Our projects are included on pages 2, 23, and 26, where you can also follow a link back to our website for more details about each project. 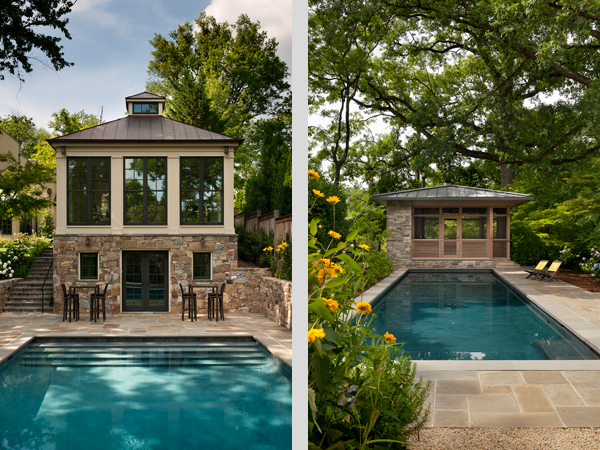 Two of the featured pools, Moorland Lantern (left) and the Treehouse (right).